Do not upload to the Steam Community or any other website. I already uploaded it to the Community. This is based on a mod that I had downloaded for Oblivion, but I can't seem to find again on the Nexus. 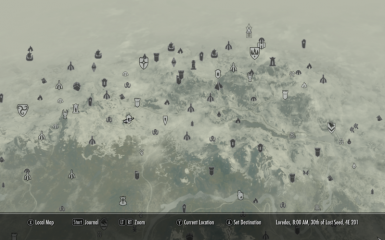 Do you want to know where every cave, fort, ruin, camp, and monument is, but don't want to break immersion too much by automatically being able to fast travel to them as if you used the tmm cheat? This mod does just that for you. One note: the map marker for Yngol Barrow still won't show up unless approached. A glitch in the game, perhaps? I don't know, but that seems to be the only one that doesn't show up. If I've missed any, please let me know. NOTE: It looks like I'm going to have to discontinue this mod. Upon examination, it looks like it doesn't show every location, even though I have them marked as visible in the Creation Kit. And, judging from PMs I've been getting, the missing markers are different for different users. Oh, well. I thought it was a good idea. Looks like the cheat code is the best way to go.